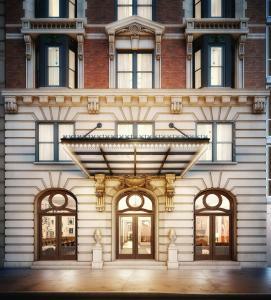 The Roger is a boutique urban retreat with a landmark location on Manhattan’s Madison Avenue. The Empire State Building is 500 metres away from the property and Macy's is 900 metres away. 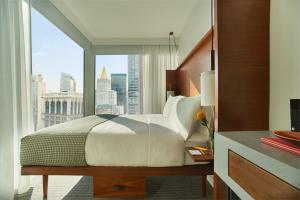 Some rooms open out on to landscaped terraces with exceptional views across the New York City. The Roger is 950 metres from Madison Square Garden and one block from the subway station. Times Square and Rockefeller Center are both situated 1.9 km away from the property. When would you like to stay at The Roger ? The Deluxe King room features a minibar stocked with gourmet food options and complimentary toiletries. This spacious room features 1 queen-size bed, a minibar and a work desk. Featuring a minibar and a flat-screen TV, this double room offers air conditioning, iPod dock and tile/marble floor. Please note that the credit card and photo identification presented at check-in must match the name on the reservation. For third party reservations, a credit card authorisation form is required. Contact the property directly with the contact details provided in your confirmation. The maximum occupancy for each room is for the total number of people that can stay in the room, including children. Please note, breakfast included rate is for 2 guests only. Guests are required to show a photo identification and credit card upon check-in. Please note that all Special Requests are subject to availability and additional charges may apply. Each day we'll check prices and send you an email for your selected dates at The Roger. If you don't have specific dates but would like to check prices for say next weekend or say next month we can check the price too. Click to write a review and share your experience of The Roger with other travellers.